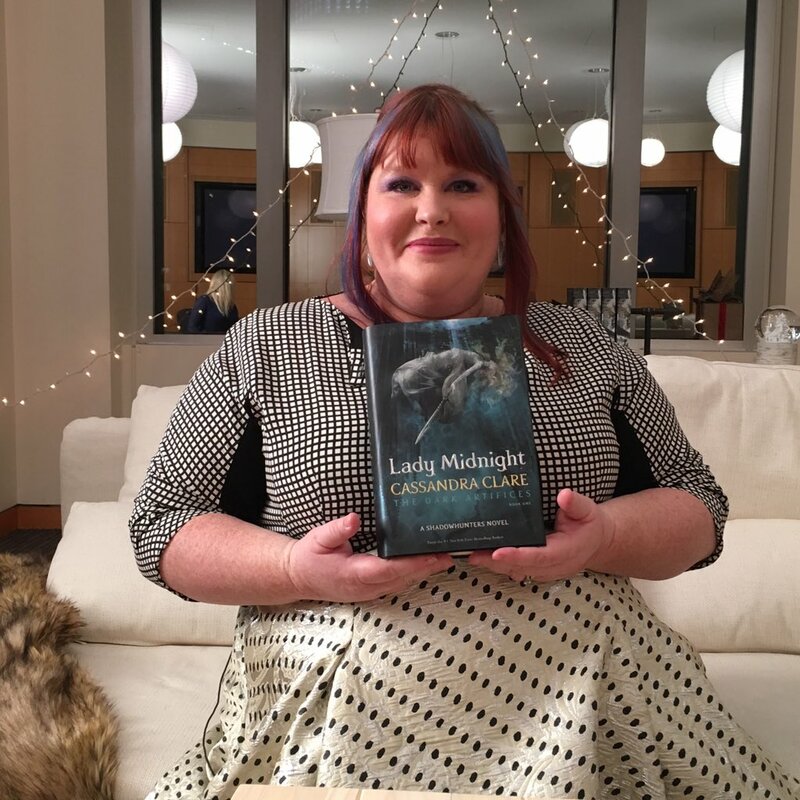 Our long waiting period has come to end because Cassandra Clare’s Lady Midnight is finally available in bookstores and online! We got an Advanced Reading Copy thanks to Cassie’s English publisher Simon & Schuster UK so we do have an exclusive and long review for you. All the information that are revealed in the following review are already public domain and will be the only ‘spoilers’ that are mentioned. I’ve been waiting for Lady Midnight since Cassie’s The Dark Artifices trilogy was announced back in spring 2011, because I was looking forward to more Shadowhunter books and because I love big families. Shortly after the announcement I met Cassie for the very first time and pretty much drilled her with questions about the Blackthorn family, which still had eight children back then. The more Cassie revealed about The Dark Artifices and the Blackthorns in general – and she shared plenty of information these past four years – the more I became interested in these characters. Fast forward to City of Heavenly Fire when we officially met the Blackthorns and Emma – I am not counting City of Lost Souls because Julian’s meeting with Clary and friends was too short. Unfortunately, it was a rather heart-breaking introduction due to the losses the characters had to suffer, but we finally got to know some of the characters and had little sneak peeks inside their heads. We saw even more of the Blackthorn family in Tales from the Shadowhunter Academy, the ten eBooks that were released last year, and by then I was in love with these characters so my excitement knew no bounds when I was allowed to read an early copy of Lady Midnight. Lady Midnight is a beautifully written book, which will enthrall you from the first page to the last. Reading it took me on a rollercoaster of emotions and while I cursed Cassie for making me feel ALL THE FEELS, I also loved every single second of it and I hope you will feel the same. Ah, love. It is one of the major themes of Lady Midnight, but as Julian remarks in a recently released snippet, “this is not a love story.” Lady Midnight is so much more than a romantic love story, although these parts gave me a warm and fuzzy feeling. Lady Midnight is a powerful love story about love in a family, love amongst friends and love amongst parabatai, so it is all about Philia (“dispassionate virtuous love”) and Agape (“Selfless altruistic love“). The familial love between the Blackthorns was one of my favourite things to read about and I teared up several times because the love Julian feels for his siblings shines through on every single page. There is one very emotional scene between Julian and one of his brothers which tore at my heartstrings and had me crying for quite some time. The love Ty and Livvy share is beautiful as well and as a twin myself, I enjoyed their scenes immensely. I hope we will see more Blackthorn family love in book two and book three. You cannot not write about parabatai after reading Lady Midnight. Emma and Julian’s parabatai relationship is quite special and I am happy that we finally have a girl/boy pairing. These two definitely have their ups and downs and it gets really complicated when Emma develops feelings for Julian, which is NOT a spoiler because it’s been on Cassie’s website for years. Romantic love between parabatai is of course forbidden, so this puts Emma in a very uncomfortable position. She knows it is wrong, by Clave standards, but you cannot exactly flip a switch and be out of love with someone. There were some very powerful and emotional scenes for ‘Jemma’ and by the Angel, you will not be prepared for them! I am particularly looking at you, chapter 27! These scenes were absolutely heart-wrenching and thinking about them makes me feel devastated and angsty. And in case you were wondering, yes we do in fact find out why romantic love between parabatai is forbidden and believe me, as much as it pains me to admit this, the Clave was right about forbidding it. The romantic scenes in Lady Midnight varied from sweet to smoking hot. They will make you squeal, freak out, hug someone/something or throw your book across the room. I love Cassie’s writing, how she paints worlds with her words, but I simply adore the romance in her books because of how it affects me. I am not ashamed to admit that a beautifully written romantic scene can leave me in tears. Cassie herself described The Dark Artifices as “a noir inspired romantic mystery” and I completely agree with it. Reading Lady Midnight was very close to reading a detective story, which is not surprising since the book is about a new series of murders as well as Emma’s ongoing investigation in her parents’ murder back in 2007. I thoroughly enjoyed how the Blackthorns, even little Tavvy, and Emma put all the clues together to solve the recent murders. The way everything fell together was very natural and when the characters found out who was responsible, it was a big ‘Oh shoot’ moment. There is a heavy focus on the faeries, who play a big role in The Dark Artifices. We meet Kieran, one member of the Wild Hunt, and other faeries who are more or less affected by the Cold Peace, which many characters disagree with and find despicable. Reading about the repercussions of this ruling showed once again how wrong the Clave really was in punishing all of the Fey folk when only a few were actually to blame. I still have hope that a big conflict between the Shadowhunters and the faeries can be avoided, but it will take a lot of work to prevent another battle or even a war. Fans, who follow Cassie on social media and who have read City of Heavenly Fire, know that The Dark Artifices will also deal with LGBT+ and neuroatypical characters. The Clave, of course, does not have a favourable opinion about both groups, ignorant as it is, but I do think that it is very important that characters who are homosexual or bisexual as well as characters who have mental illnesses were included in Lady Midnight. This inclusion, in my opinion, sends a very powerful message to Cassie’s fans and I commend her for it. Cassie on one of the neuroatypical characters, “I wanted to make it clear that he was just as intelligent and skilled, and just as worthy and capable of love, respect and admiration as his neurotypical peers, when he is struggling and when he is not, and I hope you will like him.” I love him and I hope other fans will feel the same! The Blackthorn kids and Emma, who is almost a Blackthorn herself, are absolutely amazing! I love all of them, especially Julian who has a special spot in my heart. I love Jules because he loves so fiercely and always puts his siblings first. Emma is incredible; funny, loyal, caring, and I would totally want her to be my little sister. Mark was returned to his family, thank Raziel! Mark was a very unpredictable character due to the years he spent with the Wild Hunt, but I understood his predicament and enjoyed his development throughout the book. Being away from his family for such a long time obviously changed him, but I am happy with the decision he made. The rest of the Blackthorn kids – I’m sorry for putting you all together – are completely lovable and each one of them has their own fantastic quirks. Writing about Arthur would be a big spoiler so I will keep my thoughts regarding him to myself. One character I raved about to Cassie was Cristina, because she is a badass and also the nicest person. Period. I admire her a lot and I completely understand why Emma loves her. Perfect Diego was nice, but I did not consider him to be perfect; he was interesting, though. You will know why once you have read Lady Midnight. Diana and Malcolm, two very important adults in the younger characters’ lives, are complete opposites. Diana is a very secretive person and we did not find out much about her, but that was okay, because there are still going to be two other books. I like her, but I hope she will be more open and trusting. We already met Malcolm in City of Heavenly Fire and while he seemed a bit ridiculous, we must not forget that he is the High Warlock of Los Angeles and in fact a very powerful warlock. He is friends with all of the Blackthorns and they even spend time together, which I thought was very nice. They all deserve a break every once in a while. Kieran and the other faeries: I’ve never been a fan of them, because they are so incredibly ambiguous and sneaky. Of course it was wrong how they were treated after the war was over, but in my opinion both sides have to work on themselves so that they can live together peacefully. The Shadow World without the Fey folk just isn’t right. Their storyline is not over, though, and diving even deeper into their world is going to be very interesting and probably enlightening. To this day I do not really know what to make of Kieran so I hope he will return. His background is definitely a juicy one. I found the villain of the story to be very interesting and although they were clearly in the wrong, I still understood why they did what they did. Cassie really does know how to write intriguing and unusual villains. I am looking forward to how the villain’s actions will affect the other characters in the next book. And last but certainly not least: Jem and Tessa. They had a very important job to do over the past couple of years and finally completed it in Lady Midnight. Seeing Jem and Emma together was sweet since he is like an uncle to her. He clearly cares about her, which is why Church is now an occasional inhabitant of the LA Institute. Seeing Jem and Tessa without Will still takes some getting used to, but Will is always there in spirit so I didn’t miss the whole trio too much. You are definitely in for a few surprises. The biggest surprise made me freak out a lot and it was so very hard to keep my excitement to myself! I used all caps words when I talked about it with my ‘reading buddy’. I cannot wait to see the fans’ reactions to this revelation! It was also really nice to hear about the characters from The Mortal Instruments, what they were up to these days and who got engaged, but my priority were the Blackthorns and co., so I had almost forgotten that some TMI characters would have cameos. Lady Midnight was such a strong start to The Dark Artifices and while I will always love City of Bones, because it introduced me to Cassie’s incredible world, it has lost its #2 spot on my ‘best first book of the series’ list. The Dark Artifices even has the potential to surpass The Infernal Devices and I could not be more excited for Lord of Shadows! Happy reading dear bookworms and make sure to leave your spoiler-free thoughts in the comments below! Thank you to Georgia Lawe and Simon & Schuster UK for the ARC! Just finished the preface and I’m absolutely hooked – your review has made me anxious to read more! I have to wait until Thursday for my copy to come from Amazon! Dying in wait here, and I really hope people listen and don’t post spoilers anywhere. I just started reading my copy and it is amazing so far! I can’t wait to read more! TY very much!! 🙂 I already have my copy but i love those Cassandra Jean arts so much that it worth buy another copy! 😀 TY again! Wait, you meant the poster inside the jacket cover, didn’t you? That’s exclusive to the Costco hardcover (which obviously isn’t available on the Book Depository). So is the Costco edition limited? I saw it a while ago while shopping there and freaked.